YTO is a professional asphalt mixing plant manufacturer in China, which has obtained ISO9001:2008 and ISO14001 certifications. 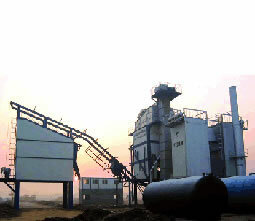 The available asphalt mixing plant models are RD60, RD90, RD105, RD125, RD175, RD200, RD240 and RD320. 1. The burner of our asphalt mixing plant is highly efficient and energy saving. It can save 5.3kg fuel when one ton of asphalt mixture is mixed. 2. The elevator is designed with double chain structure and is characterized by smooth running and long service life. 3. With the help of high precision weighing sensor, the measuring system and the weighing system can guarantee the high precision asphalt supplying. The asphalt supplying difference is not more than 0.3%. 4. The scale board inside the asphalt mixer is made from wear resistant alloy material. This helps prolong the service life of the asphalt mixing plant. 5. The dust removal system consists of gravity dust collecting system and bag dust collecting system. The dust is divided by the two systems into thick grain whose diameter is not less than 0.074mm and fine grain whose thickness is less than 0.074mm. Then the grains are separately weighted and conveyed into the mixer, making the dust adding proportion more scientific and more reasonable. The dust discharging concentration is lower than 20mg/m3. The filter bag is provided with two step temperature protection and self cleaning function. 6. The operation system uses full automatic control mode, so it is easy in operation and reliable in performance. 7. The special oil heating and heat preservation system is highly efficient and energy saving. The heater is able to start and shut off automatically. 8. The control system of heat transmitting fuel stove can start and stop automatically according to the instruction of a timer. 9. The maximum production of our asphalt mixing plant is 320t/h. The weighing difference is within 0.25% or 0.5%. For more parameters about our asphalt mixing plant, please refer to the PDF file. In addition, we also offer wheel loader, motor grader, rotary farming machine, crawler tractor, and other construction machinery and agricultural machinery. Please feel free to contact us if you want to get more information. We look forward to working with you.